Italian Pasta Salad is a must-have at family gatherings any season. Our lightened-up version packs a mean nutritional-punch with crunchy and colorful veggies, zippy turkey pepperoni and zesty Italian dressing. 1. Bring a large pot of water to a boil. Add pasta and cook. When pasta is al dente, drain pasta and rinse with cold water to cool. If making pasta ahead of time, toss with olive oil to help prevent from sticking. 1. 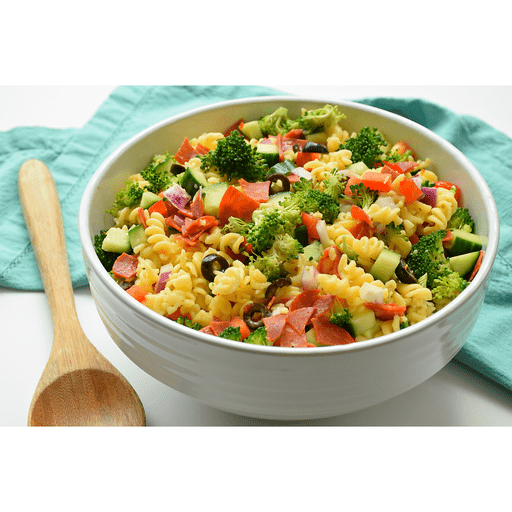 In a large bowl, combine broccoli, cucumber, bell pepper, olives, onion and turkey pepperoni. Add pasta and stir to mix. Pour in Italian dressing and toss to coat. 1. Cover and chill in the refrigerator until ready to eat. Serve chilled, stirring again before serving. For gluten free Use gluten free rotini in place of whole grain rotini. Calories 270, Total Fat 9g (Saturated 0g, Trans 0g), Cholesterol 5mg, Sodium 490mg, Total Carbohydrate 39g (Dietary Fiber 5g, Sugars 4g), Protein 7g, Vitamin A 15%, Vitamin C 40%, Calcium 4%, Iron 15% *Nutritional values are an approximation. Actual nutritional values may vary due to preparation techniques, variations related to suppliers, regional and seasonal differences, or rounding.